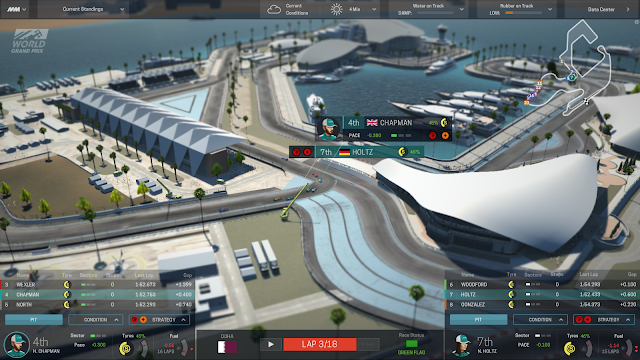 Start your engines and get on the grid for what is sure to be a titanic battle of wit, as you navigate your way through the depths of defeat and euphoria of winning, in Playsport’s latest incarnation of Motorsport Manager. 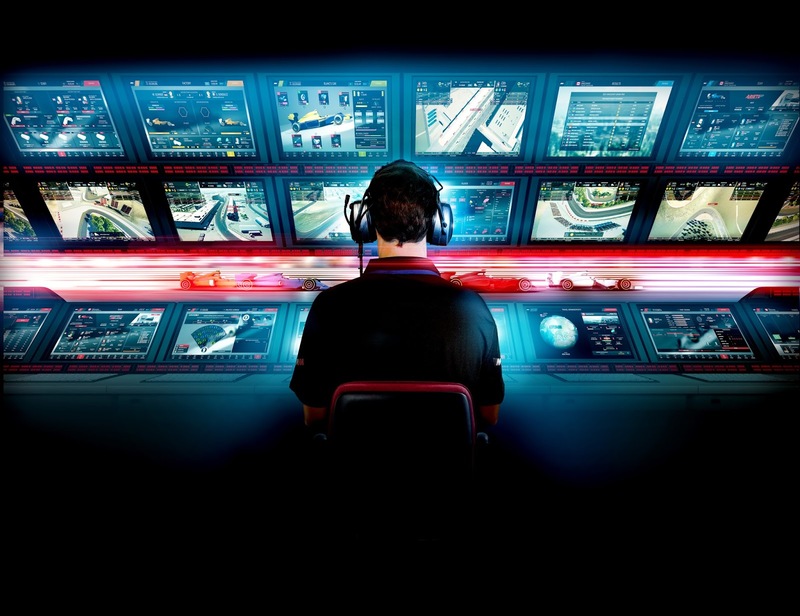 Do you think you have what it takes to run a successful racing team? 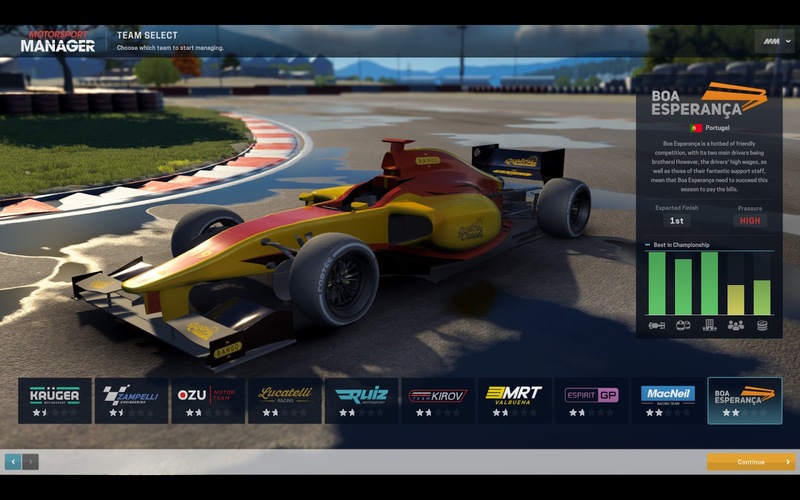 Here’s your chance, running everything from race strategy to deciding on new regulations, this is where you get to prove yourself. The hugely successful ‘indie’ mobile game is making its way to the PC/Mac, with backing from SEGA, and is all set to put the pedal to the metal when the game is released on 10th November. The mobile game always provided that hugely entertaining battle between fun and frustration, as you climbed the racing ladder, vying for each championship as you went. The development team have tried to encapsulate this, as the game is scaled up and transferred to a more powerful platform, housed within a similar construct to Football Manager, another hugely successful title from the SEGA stable. Football and Motorsport aren’t exactly bedfellows you might argue but the way in which the menu system has been adopted does keep the essence of the original mobile game, whilst making it very easy to navigate. Navigation simplicity aside, there is further help when you first start out in the form of an ex-driver avatar, who’ll run you through the basics of each screen. The flat-capped, mustachioed champion bears a striking resemblance to ‘Our Nige’, so much so that I felt compelled to read out the onscreen narrative in my own West Midlands twang. Joking aside, it’s a great way to get to grips with everything the game has to offer as left to your own devices I’m sure it would all be a little overwhelming. Want to get started at the top of the tree or prefer to play the long game? That’s a question you’ll have to ask yourself when you first start out. Either way you still have a battle on your hands, as the targets and expectations are skewed based on your choice. So, don’t expect to take charge of the equivalent of Mercedes or Red Bull and get an easy ride from the Chairman if your results are poor but by the same token Manor’s equivalent aren’t expecting to win the title either, well at least not in the first season. I decided to start my journey in the basement, in the lowest tier with the 9th worst team, leaving me very little else to do but improve. 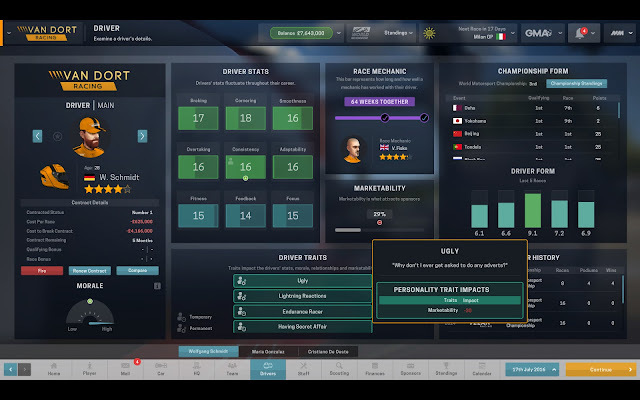 Just like in real life you have different levels of drivers at your disposal, whether that be the ones you adopt when you first arrive at a team, the ones you face each week, the ones you scout or the youngsters you develop. Each driver has their own strengths and weaknesses that you must exploit to improve results, maximise your marketability or string along until someone better comes available. In my first season the lead driver was ineffective at setting up the car when compared with the second driver but come race day a different driver emerged, especially as one of his traits was the refusal to accept team orders. The prima donna even requested I sack his race engineer at one point when they clearly didn’t see eye-to-eye, making you question the level of detail that may crop up as the team expands and more staff need to be controlled. Drivers, what do they know eh?.. Quite a bit it turns out and they’re pivotal in getting the best from the car each race weekend, as they provide feedback as to how the car needs to be set up to meet their demands. However, you have overall say. Want to run less wing and be quicker on the straights? that’s your call, just as tyre pressures, suspension and engine settings will play their part too. Time spent honing these skills in the lower formulae will pay dividends in this respect as when you turn your attention to the big leagues, the payback can be much smaller. Strategy, just like the mobile version of the game, is almost a sub-game in itself, with the lesser teams able to make up places with a quick stop or throw of the dice. You’ll have numerous tools at your disposal as you help your drivers at each event, be it that call to come in early and undercut the opposition during the pitstop or obey the golden rule - always be on the right tyre at the right time. That way you too may ‘do a Senna’, taking advantage of changeable conditions like he did at Donnington in 93. Every successful racing team has a base of operations and for many of the top teams money spent on these resources is the difference between beating your rival and trolling around at the back of the field. 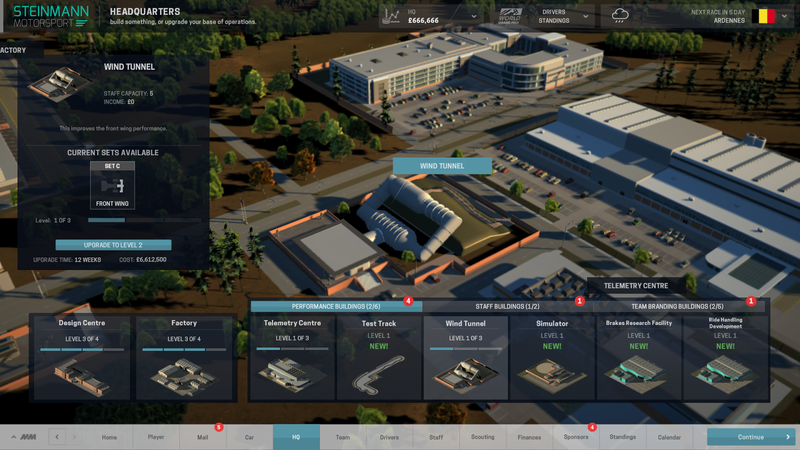 Infrastructure must be viewed as a long term objective, as it can take weeks for buildings to be constructed, but once they are it gives the staff the ability to extract more performance, making it a cost vs time vs reward conundrum that you’ll have to unravel. The drivers aren’t the only personnel you need to keep happy, with all manner of mechanics and engineers needing to be retained, fired or employed based on budget and skill level. Afterall Motorsport is a team game, meaning you’ll need to keep harmony amongst the ranks and get the best from what you have whilst you do. Like the drivers each member of the team will bring their own unique qualities, which must be matched by a certain level of funding and infrastructure otherwise they’ll go to waste. 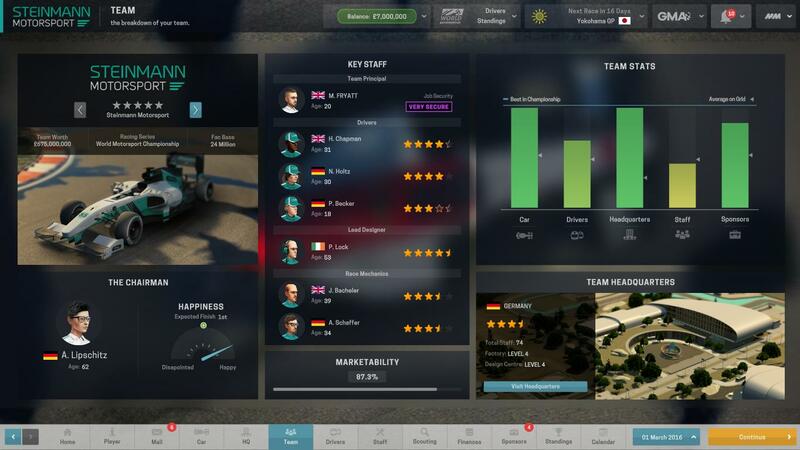 At the end of my first season I failed to negotiate a new contract with my second driver and was forced to go off and scout new talent, a surprisingly difficult task made moreso by a lack of budget and lowly championship position. In the meantime I’m given a replacement on a rolling contract but let's just say I’d probably do a better job of setting up and driving the car. Development is a fickle game, it can not only bring performance but often comes with the side effect of increased unreliability. There’s a tendency to just run everything flat out, but this can end in disaster, especially in the early days, as you have to manage the life of components as well as the drivers temperament. Pushing too hard can end a race, with either a part failing or a driver spinning under pressure. That’s not to say you have to pussyfoot around either, it’s all about solving the goldilocks equation and is something that should keep you coming back to this game over and over again. Whilst creating and running your team is the core activity in the game there are peripheral elements that must also garner your attention. The GMA (General Motorsport Association) works much like the strategy group in F1, with teams able to vote through rule changes. And, just like the strategy group, the GMA see’s politics play its role. Whilst these decisions can help to shape the championship you’re in, they can also be used to maximise your performance. 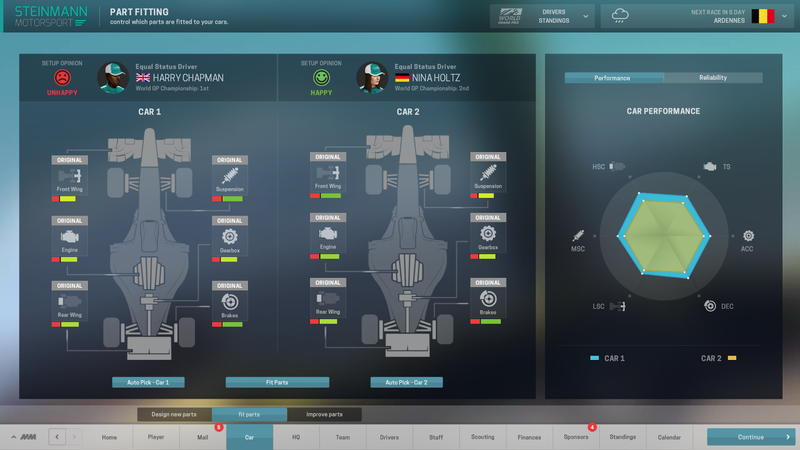 For example, in my first season I helped to vote in a ‘spec’ gearbox to reduce costs, simply because I have less money than everyone else and it helps to narrow the performance margin. Graphically the PC/Mac version is another level when compared with the mobile game, with the ‘follow the dot around a track’ swapped out for a more aesthetically pleasing 3D backdrop, that can be scaled and moved to your content. Even with this new glossy facade you can tell that the designers have put considerable effort into the gaming engine, with as much detail crammed in as you can handle. 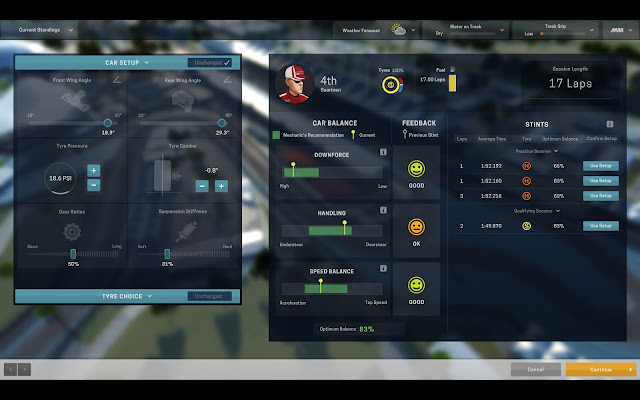 The career mode is certainly something that needs time in front of the screen to get the most out of but will ultimately provide a huge amount of satisfaction, even if you make the odd mistake along the way. Having said that there are other modes you can exploit, such as single race or challenge mode, the first is self explanatory but the latter gives you several scenarios which have a wide array of targets to be achieved. It's "prima donna", Italian for "first lady".